A: ‘We thought of it as a dialogue,’ says general manager Joyce Oreña. 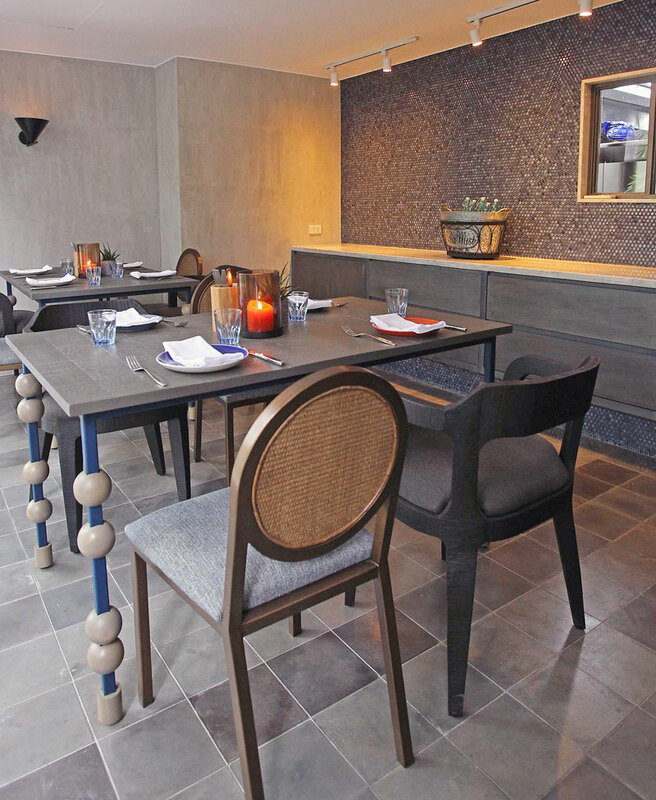 With Manila speakeasies sprouting up behind secret doors, a former fashion model and a group of seasoned restaurateurs/ hoteliers now present another hidden gem: Q&A kitchen + bar, a Modern European restaurant that’s discreetly located along San Agustin Street in Salcedo Village, Makati. No wonder its standards are way above five-star. Even the washrooms are clean and spacious. From the street it’s easy to miss among the flashier signs for a hotpot restaurant and Korean market, but ascend some unprepossessing stairs to the second floor of the ACCM Building and you’ll come upon a very modern-looking sign for Q&A. Inside, general manager Joyce Oreña and Alain Raye, the Michelin-star chef who once fronted the popular French restaurant La Regalade in Makati, show us around a decidedly designer-friendly interior: Eric Paras “designed it like a kitchen,” says Joyce, with honeycomb tiles and bespoke, eclectic wooden furniture. The open kitchen is lit like a Hopper painting, where chef Raye guides his Filipino cooks in rolling beetroot gnocchi. We sit down with Joyce to explore the menu and conduct the type of Q&A we’re most familiar with about this tantalizing new food concept. A: “We thought of it as a dialogue: we wanted the food to do the talking, so everything is fresh and homemade,” says Joyce. Chef Raye worked in Michelin-starred restaurants in France and Vancouver for 17 years before settling here and eventually marrying a Filipina. He’s apt to re-explore the idea of classic duck confit with his duck croquette, “more humble and approachable” than the French dish, using Fontina cheese and a verjus de raisin sauce. 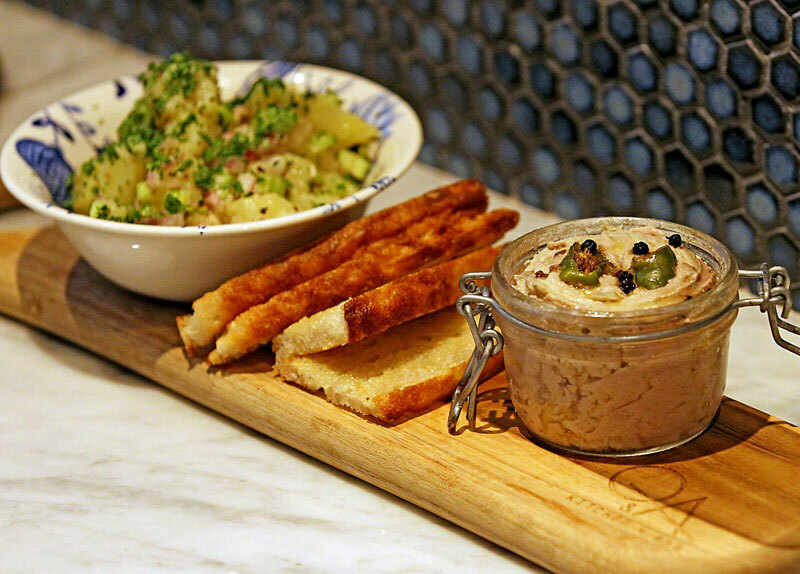 Almost everything is done in-house, from the handmade pastas to the fresh-baked bread and butter. A: It picks up on this dialogue theme: menu categories include “Happy” (for appetizers, which “are meant to be shared”), “Healthy” for salads (like the delish Caesar salad with Iranian dates and a fresh gorgonzola dressing), while “Handmade” is focused on the chef’s homemade pasta dishes. These include a terrific Manila clam fettuccine (“I love Manila clams,” confesses Joyce), a delicious beef bourguignon using maltagliati pasta, plus very fresh beetroot gnocchi (he uses real — not powdered — potato, hence the soft and yielding texture) and homemade ricotta. It’s all about the pride of fresh ingredients and the love and care that go into handmade dishes. Eric Paras designed the warm, cozy furniture and interiors. Q: Where do they get their ingredients? 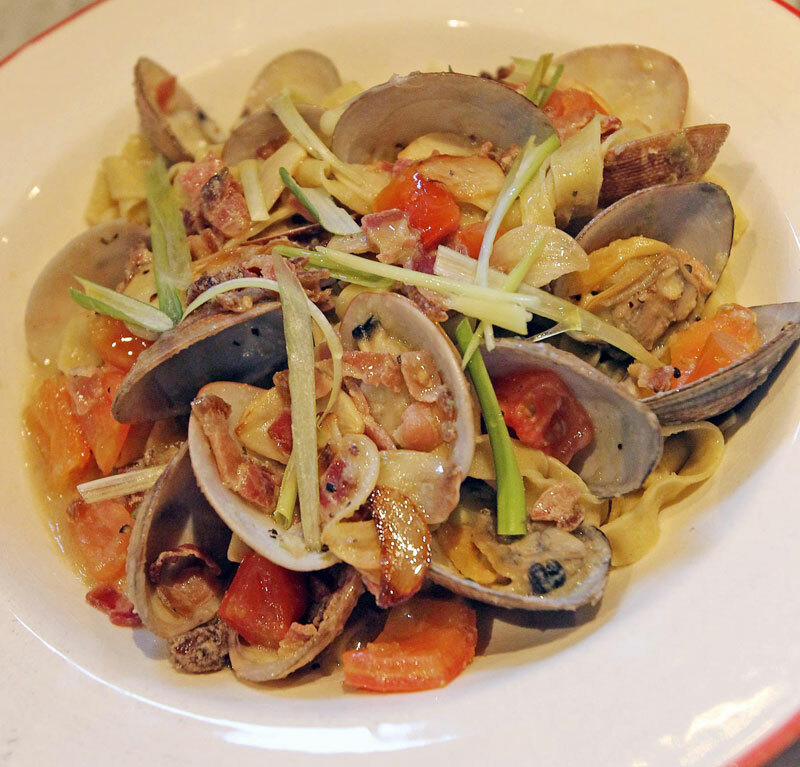 A: “The concept is to do fresh pastas,” Joyce says. Joyce and her business partners got contacts for organic farmers from Tourism Secretary Berna Romulo-Puyat, so they visited farms in places as wide-ranging as Abra up north and Silang down south. 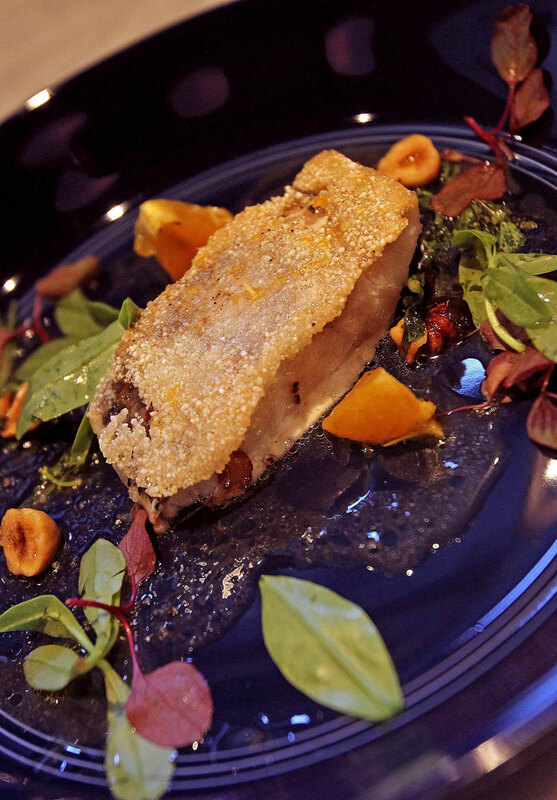 Our main course of pan-seared sea bass with garum (fermented Greek fish sauce similar to our patis) and mandarin was a lick-your-plate-clean stunner, cooked to perfection with an ultra-crisp crust made of crushed walnuts. 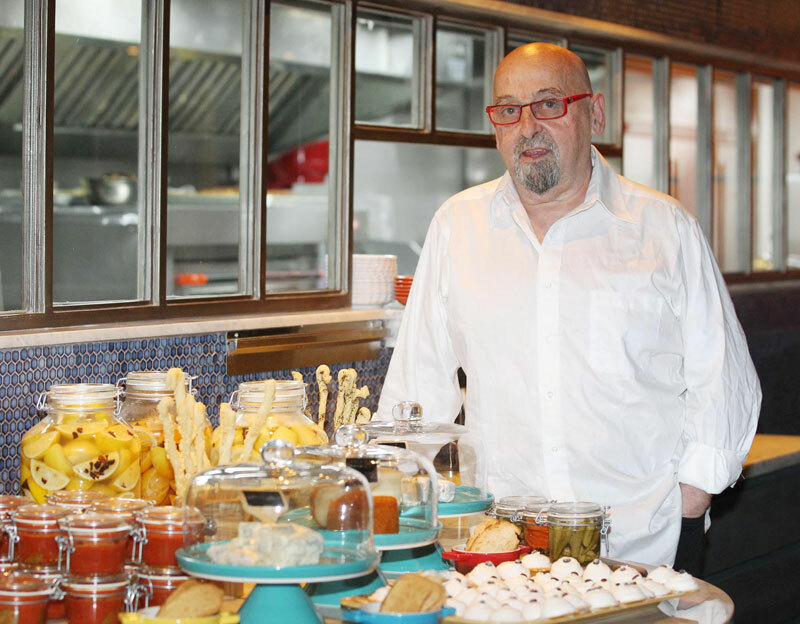 “We want slow food to come back, but without the wait,” explains Joyce — “slow” meaning prepared by hand without waiting long for the food to arrive, because chef Raye prepares everything beforehand. The butter is churned in-house, and they make their own ice cream (“like a glacé with egg white,” explains the chef, beaten by hand, then made into a sandwich and placed in the freezer). All the breads (grissini, ciabatta) are likewise kneaded by hand. All the desserts are worth talking about, from the homemade Amaretti cookies to the Budino-like crème caramel (made with salted caramel and whipped cream), to the double-chocolate ice cream sandwich with different layers of chocolate (dark choco ice cream, cacao nibs and bitter Belgian chocolate) with apricot jam on the side that reminded Scott of the Italian ice cream sandwiches he had as a kid. Culinary-wise chef Raye is not afraid to go outside the box, mixing savory with sweet in his lemon-curd sesame-seed ice cream sandwich, which has grilled fennel on top and a touch of Maldon sea salt balancing out the tart ice cream and sweet cherry compote. It’s different but a must for the epicurious: try all the components in one bite to fully enjoy. A: “It’s a little bit hidden, like a destination,” says Joyce. Inside, the feeling is “comfy and very cozy.” Next door is the Q&A bar, also bespoke in design, which should make a very worthy addition to Makati’s hidden cache of speakeasies. 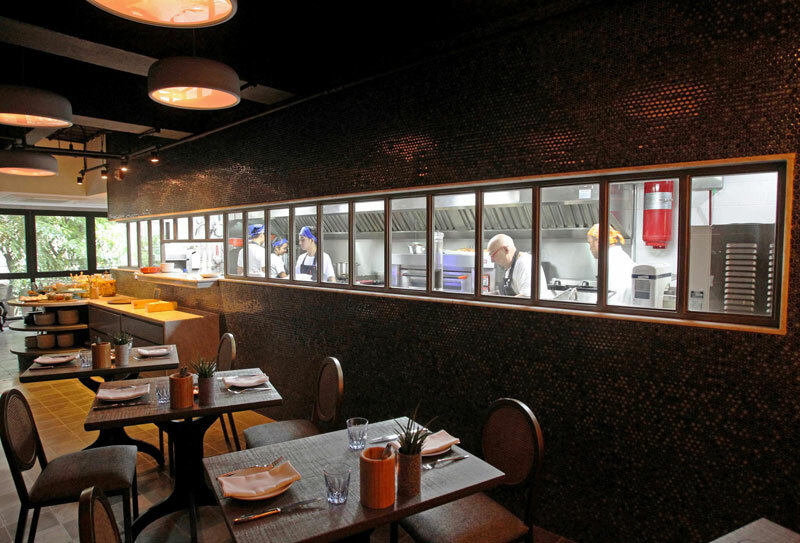 Artful atmosphere: Q&A’s open kitchen is lit like a Hopper painting. Q: Why go to Q&A? A: This new kitchen/bar is a must-visit because in today’s fast-food world it’s a bit of an anomaly — a modern throwback that urges diners to take it slow, settle into a booth or table and order dishes that are lovingly prepared by hand. Joyce herself painstakingly selected the assortment of crockery it’s plated on. If the surrounding buildings weren’t a reminder you were in the middle of the CBD, you’d almost think you were in a bistro in France presided over by a paternal chef-patron whose hand is in everything — literally. Michelin-quality food at reasonable prices? That’s always a surefire way to get people talking. Ballsy moves: Eric Paras designed the quirky furniture, which boast table legs with balls. 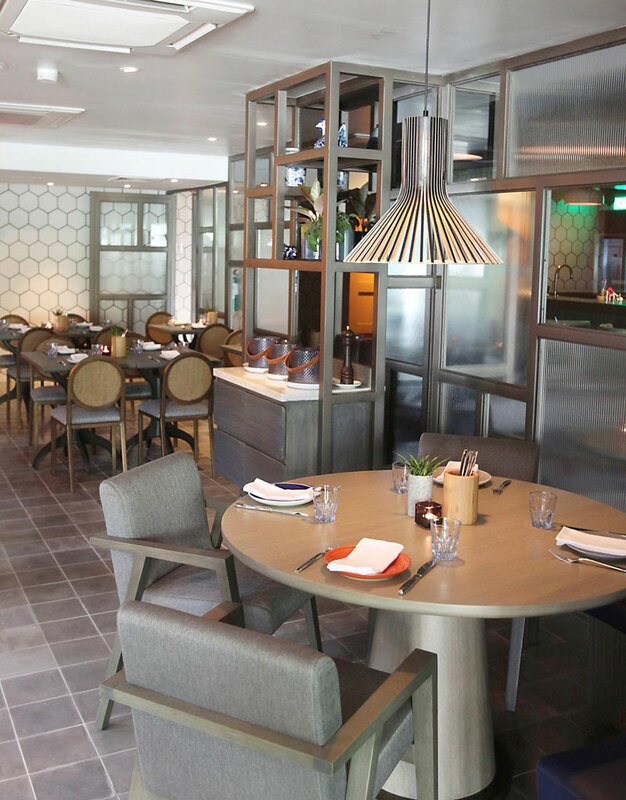 Q&A kitchen + bar, currently open for dinner only, will start serving lunch on Nov. 2. Q&A is located at Unit 2D, second floor, ACCM Building, 102 San Agustin Street, Salcedo Village, Makati City. Call 624-4388 or 0917-859-5678 to reserve. Visit qandakitchen.com for more information.